You talk too much! That could be the thought of someone you converse with. It would mean that you don’t allow that person to exchange her ideas in the conversation, turning what could be a monolog into a dialog. Not only would your actions indicate that what she’s attempting to say is not important, it also states that you believe what you’re saying is so important that it doesn’t require additional input. That can be a serious turnoff when attempting to exchange information. It becomes a more serious problem when two people are in a relationship. Such behavior can be the slow march to the uncoupling of the relationship. When you’re really interested in someone, display that interest in the way you communicate. That should be done verbally and nonverbally. The nonverbal display can be made by the nodding of your head at appropriate moments, and/or even the sound of a grunt; just be cautious that a grunt is not perceived as a negative disagreement if that’s not your intent. In order to communicate more effectively with others, you must display the ability to let the other person feel that you’re being attentive to what they’re saying. To do less than that demeans the other person and places you on a pedestal, from which it may be difficult to descend. Even if you do descend, you may have lost the opportunity to gain greater insight per how that person thinks, which could lead to the loss of greater insight from which you could think on a broader perspective. When negotiating, the person that speaks the most will tend to give away his negotiation position, and information that might better be kept undisclosed. That information may also be used against him. That’s one reason why good negotiators will ask follow up questions, while great negotiators will answer a question with a question; it’s the latter’s attempt to gather more information. When engaging in a negotiation, be an astute listener. Listen to what’s said, how it’s said, and listen for what’s missing. Don’t over talk the other negotiator and don’t be so gabby that you miss the opportunity to gather more information. Once you’re adept at listening more and talking less, the more you’ll be able to see and hear what you’re missing in the negotiation. You’ll be able to magically see the other negotiator through a brighter light of transparency. That will leave you in a very powerful negotiation position … and everything will be right with the world. 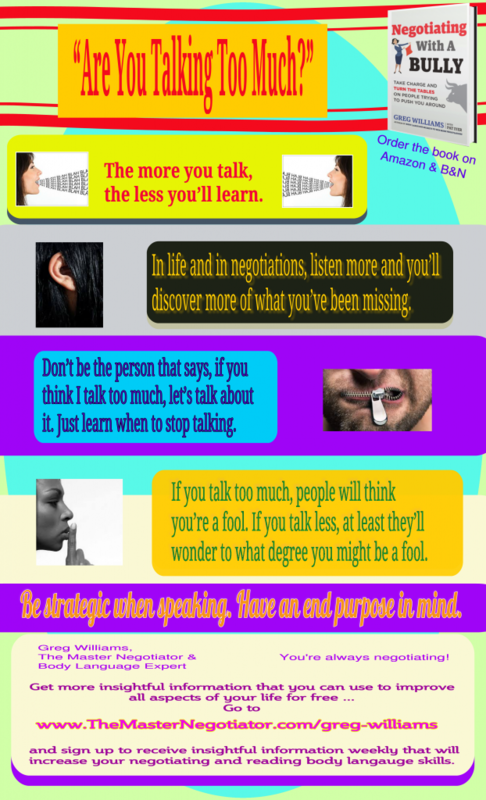 The post “Are You Talking Too Much?” – Sunday Negotiation Insight appeared first on The Master Negotiator & Body Language Expert. Why Board Members Are Not Fundraisers?